Island View is your 'home away from home' overlooking Bribie Island and the beautiful Pumicestone Passage. We aim to provide a quality and comfortable stay that is affordable for families and better value than a hotel room. 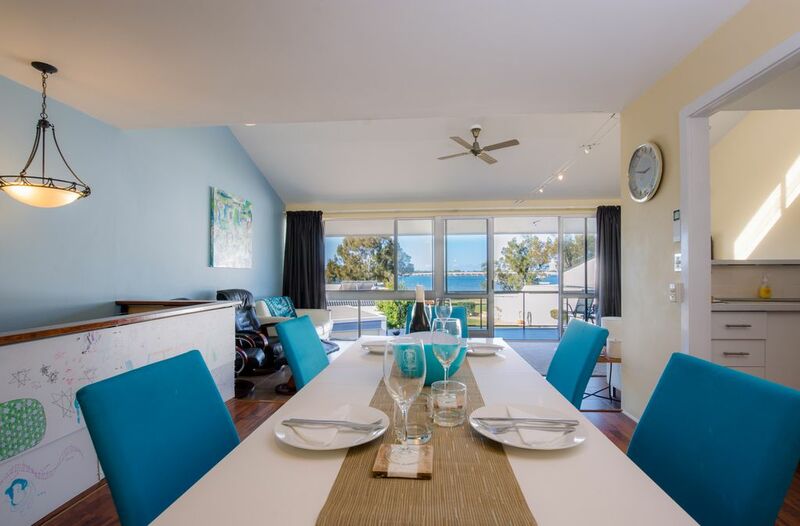 Situated a short stroll away from the Marina (Cafe, Boat Hire, Italian Restaurant), and the fantastic Sandstone Point Hotel, Island View is a 3 Bedroom townhouse in a relaxed gated complex on the waterfront at Sandstone Point. It is a perfect base to explore and experience all this wonderful region has to offer. Boating, fishing, swimming, jet-skis, kayaking, 4WD adventures, hiking, golf, riding, bird watching, dolphin spotting... or simply relax and unwind in this beautiful location. 3 Bedrooms (Queen, Queen, & Single + trundle). Sleeps 6. Spacious Living Area (Air-Conditioned), Balcony, & Dining Room with beautiful waterfront views. Full Kitchen (Fridge/Freezer, Oven, Stove, Microwave, Toaster, Kettle, Dishwasher). Swimming Pool (communal), Single Garage + permit for an additional vehicle. Note: Property has stairs. Upper Level: main bedroom, bathroom, kitchen, dining, lounge, balcony. Lower level: 2 bedrooms, bathroom, Courtyard, Laundry, and Garage. Linen, Towels, Crockery, and Cutlery. Games, Puzzles, Toys & Books. * Please contact us to arrange use of Fishing gear and/or Kayak. Use at own risk. Loss or Damage of equipment is the responsibility of guests. # Check-in anytime from 1pm onwards. Check out is at 1pm. # Island View is NOT SUITABLE for any kind of party, event or function. We enjoy a wonderfully peaceful & relaxed beach side atmosphere. # Children must have Adult supervision present at all times whilst using the Pool area. Please try to be mindful of noise levels when using the pool. # No Smoking anywhere inside the property or in communal areas. Smokers may use the courtyard area (please close doors to prevent smell entering the house). SECURITY DEPOSIT: A deposit of $200 (for stays up to 6 nights) or $350 (for stay of 7+ nights) is collected at time of booking. This amount is refunded promptly after your stay provided the property has been well cared for (usually within 72 hours of check-out). PEAK SEASON: Please note peak pricing is set between 16th December & 6th January each year, as well as the Easter Weekend. We generally like to use the place ourselves during these times but will make them available if booked well in advance. THANKYOU for taking time to read about Island View. We love our little place by the beach and hope you will too. If you have any further questions please don't hesitate to contact me. The view... Beautiful sunrise over the water each morning. Glorious winter weather. Fishing. Kayaking. Drinks on the balcony. Lovely community feel. Time spent and memories made with friends and family. Our family wanted a place to rest and the kids to swim, and this place was great. We were the only ones to use the pool, which our kids loved. The house was great, with a beautiful view from the upstairs area. The owner replied promptly to our booking request. Instructions were clear for easy entry and exit to the property. While this home is not far from the water it is not a waterfront property, it is the row behind the waterfronts, but does have water views. I don’t think the place had been cleaned properly. There was rubbish in both bathroom bins, the floors were sandy and gritty, lots of dust around on footstools, benches and floors, clothing left in wardrobes, old used soaps left in the bathrooms (which we did not use and left there), opened packets of food on the pantry, one even past its use by date, opened foodstuffs left in the fridge, food left in the freezer. We did not use any of the food that was left in this home. Holes in the curtains, one of the vertical blinds had fallen off in the downstairs bedroom, remote for the garage door did not work, there was a fly swat, wooden blocks and some food tongs on the floor resting against the wall in the lounge area, which we left where they were. We placed our used towels in the laundry basket, emptied the rubbish bins, including the bathrooms, we did not strip and remake beds as the instructions said that HomeAway guests were not required to do cleaning. Whilst we had an enjoyable time, we cannot give the home a 5 star rating because of the reasons listed above. The property does need a bit of maintenance. The front screen door is difficult to close, marks on some walls. With the risk of food contamination, it is not a good idea to leave open food items in the home when guests arrive. No one wants to use someone else’s used soap either. Judging by Airbnb standards, this home was unfortunately was not 5 star. Everything about Island View was just amazing - Joe's communication was excellent and his instructions of how to gain access were perfect. The home has everything you could possibly want, and was immaculately clean. The location is incredibly quiet yet only a quick drive to Bribie Island or a short stroll to the Sandstone Point Hotel. I would recommend staying here for either a family holiday, a relaxing break, or if attending an event at the Hotel. Thanks Martin... glad you enjoyed your stay. Hope to welcome you again in future. We really enjoyed our stay at the property. It’s ammenities were all in good order, the kitchenware was of a good standard and it suited our family’s holiday needs well. However, there was a lack of plastic cups for our small children and found that the garage was too small for our car. But these are only minor things. We thought the signature sign around the stairs was a nice touch. Thanks for the feedback Ryan. Plastic cups are fairly easy - good idea... the garage is a bit more tricky - but we do have plans to reconfigure shelving in future (might add 30cm length)... but will always be a compact garage. Many thanks, Joe. With a group of 6, we had a fabulous holiday. Convenient location, everything you could need was at your fingertips. Great communication with owners. We will stay again.